Moist, flavorful, and mildly seasoned with fresh herbs makes this a roasted turkey to remember. Place oven rack to lowest position. Preheat oven to 350° F.
Remove giblets and neck from the inside cavity of the completely thawed turkey, rinse outside and inside of bird with cold water, and pat dry. In a bowl, mix softened butter with herbs and seasoning. Carefully lift the skin away from the breast meat with your hand, being careful not to tear the skin. Gently rub half the butter mixture under the skin. 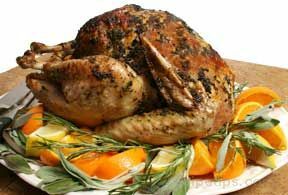 Divide the remaining herb and butter mixture, placing half inside of the turkey cavity and rubbing the remaining on the skin of the turkey. Place the roasting rack inside the roasting pan and the turkey on the roasting rack. Tie the legs of the turkey together with baking string and tuck the wing tips under the turkey. Bake according to directions or until a thermometer reaches 175° F. at the thickest part of the breast or thigh. Baste turkey every 45 minutes with drippings from the turkey. 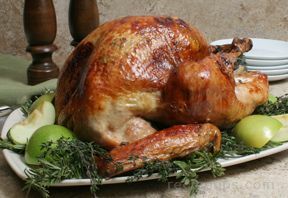 When turkey has reached an internal temperature of 175° F, remove from oven, cover with foil,* and continue roasting 'til done. 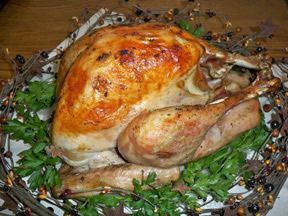 Allow turkey to rest for 20 to 30 minutes before carving to preserve the natural juices. 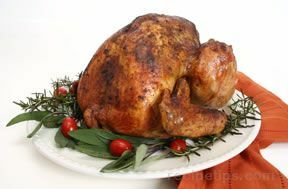 *To prevent over-browning, cover turkey with tin foil during the last 45 minutes to an hour of roasting time.